Según los comentarios en inglés, para luchar contra Alani debes juntar 10 Fragmentos de Cielo y con ello formar un Cristal de Cielo, el cual elimina la aureola que le envuelve. Estos fragmentos se pueden obtener matando mobs en el Valle de la Flor Eterna o en las recompensas de las diarias del Loto Dorado. Su drop es bastante bajo por cierto, así que suerte! ahora puede ser vendida en la subasta "normal"
Ayer matamos a Alani entre dos personas y la chica que uso la piedra y dio el ultimo golpe no tuvo montura y yo si. Hablamos con un GM y confirmado por Blizz, desde el 8.1 solo cae una monturat por party, dando igual quien use la piedra. To get your hands on this mount you need to be Exalted with Los Augustos Celestiales and then you should be able to buy it. From what ive heard you can buy this for 10.000g but i am not sure yet. 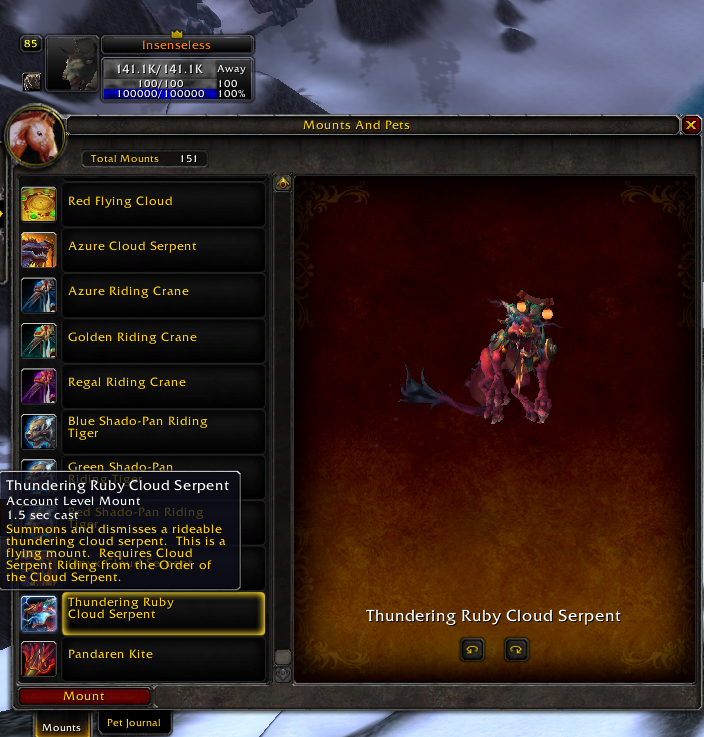 A few days ago I confirmed that this mount, Riendas del dragón nimbo rubí tronador, drops off a level 92 rare spawn called Alani the Stormborn who is located flying around the Vale of Eternal Blossoms. My video of the kill can be found here: http://www.youtube.com/watch?v=pLwzUnLKMwo . The mount drop of this rare spawn makes Alani the MoP version of the TLPD/Aeonaxx. Alani has a buff called Embozo de nimbo which makes him immune from being attacked. This buff is removed from an item called Cristal celestial which is created by combining 10x Fragmento de cielo. Alani <the Stormborn> is a lvl 92 rare Dragon that is found flying around The Vale of Eternal Blossoms in Pandaria. Alani is MoP's Time-Lost Proto drake/Aeonaxx, but unlike them she is easily found. She does however, have a buff Embozo de nimbo that makes her immune to attack. The buff is removed with a Cristal celestial which is made by combining 10xFragmento de cielo . Once killed she 100% drops the mount Riendas del dragón nimbo rubí tronador. Skyshards have a low drop rate of about 1/1000. They can be found in Tesoros del valle (from Golden Lotus Dalies),Bolsa de bienes útiles pequeña (from rare spawns in the Vale) and looted from most mobs found in the Vale of Eternal Blossoms. There is also a chance to get shards from archaeology within the Vale of Eternal Blossoms. Los Augustos Celestiales's Mounts, almost all of them are cloud serpents so you need to be able to use them, one of the new mounts added in 5.2 is not a Cloud Serpent, so you don't need the . I am going to show you all the mounts below and some tips after the mount. Riendas del dragón nimbo augusto tronador - You can get this mount upon hitting Exalted Reputation with Los Augustos Celestiales, this Mount normally costs 10,000 gold but if you have it costs 7,000 gold. Riendas del dragón nimbo rubí tronador - You can get this mount from the NPC named Alani, you have to farm up to 10 Fragmento de cielo and convert it into Cristal celestial and then hit Alani with it. More info to collect shards Here. Riendas del dragón nimbo de cobalto tronador - There's been rumours that this mount will be dropped from the new World Boss named Nalak, i am going to edit this comment when i get the right information about this mount. Riendas del dragón nimbo ónice - Exalted Shadopan & ¡Ataque sorpresa! Got the 10 Shards today. Was not all that bad. Collecting them took me about 11 hours added up. Yesterday I started farming them at 3am, for 8 hours. This morning i've gotten the last 2 in 3 hours. Do this at night, there will be much less competition. Also for the rep, farming Dios de la guerra Dokah is super easy. He spawns about 2 times per hour and has a 78% chance to drop 1 - 4 Insignia celestial robada. Also you can level up Shado-pan, Golden Lotus and Klaxxi too while farming him since he drops Insignias for them too. And don't forget to buy the Gran mención de Los Augustos Celestiales once you hit Revered. It will double the rep you get, with Don de gentes it will be (once you are Revered) 2.2k rep for each Insignia. From patch 6.2.2 on, the Riendas del dragón nimbo rubí tronador no longer has a reputation requirement with Los Augustos Celestiales to learn. it's not because its hard to farm the Fragmento de cielo but extreme time consuming or it was for me. For those of you curious why so many Cristal celestial farming groups or people selling Alani kills showing in the group finder here is why. As of patch 7.0.3 the drop for Riendas del dragón nimbo rubí tronador is now shared drop between party members. This means that you can farm Cristal celestial in a group. Funnel the drops to a single player then kill Alani much quicker than doing it solo. Or if you have collected the prerequisite 10 Cristal celestial you can sell the party slots and still collect the mount for yourself. Looted today by everyone in my 4-man party. I had the Cristal celestial and activated it (did not attack Alani with any other abilities) and my three friends (one of which did not even tag Alani with abilities either) were in a group with me. All of us got the mount, despite 2 of us not tagging with abilities. I've seen others confirm elsewhere that the person with the Cristal celestial is 100% guaranteed a "tag" on Alani for the mount, and at least 1 other person in the group must tag in order to "unlock it for everyone." I'd be inclined to agree with this based on our experience, but another thing to point out is that 3 out of 4 of us had stripped down to our skivvies in order to "ensure" that everyone got to hit Alani without killing her for a tag. (Even though that didn't quite work out as planned...) She did however live for a good 5-10sec as opposed to being immediately nuked. I farmed for about 90 minutes to test my luck on getting some Fragmento de cielo. I got none. Saw that one of these was going on my AH for 60k and bought it. If you can find one on your AH for a price like that and you have the gold, buy it. You can easily farm twice that amount of gold in the same time it seems to take for the amount of Fragmento de cielo to drop. "Desde su infancia, los dragones nimbo tronadores se sienten atraídos por las tormentas. Les gusta perseguir a los rayos a través de las nubes oscuras y agitadas y bañarse bajo la lluvia."